For choosing the best aquarium filter that can keep your fish tank clear and free of ammonia and nitrite, firstly you should understand the mechanism behind each type of aquarium filters. The most popular types these days such as power (HOB), canister, internal, corner (box), sponge filters… are all useful if you use them in a proper way that they are intended for. This article will outline the fundamentals of some popular types of aquarium filters in the market today and recommend you the best fish tank filters from various well-known aquatic brands. How does an aquarium filter work? How to choose an aquarium filter? How many gallons per hour (flow rate) will I need? Which type of filter is best for my aquarium? What to consider when choosing a fish tank filter? How to set up a fish tank filter? How to clean a fish tank filter? How to reduce flow of aquarium filter? What is the quietest aquarium filter? Should aquarium filter always be on? Firstly, you should acquire some knowledge about three types of filtration that are used by most aquarium filters today. The main purpose of fish tank filters is to remove dangerous chemicals, excess food, decaying organic matter, and the waste products of fish. Fish constantly excrete waste while swimming around. If the waste is not removed at proper intervals, then the toxins from the tank will build up to high concentrations which may poison the fish. Mechanical filtration (media: sponge/foam, floss, pre-filter media…) is to trap solid matters for manual removal every cleaning the filter. The mechanical filtration keeps the water free of floating wastes and helps to prevent the filter clot during operating. Biological filtration (media: ceramic rings, bio-sponge, bio-foam…) is to provide a house for denitrifying bacteria to build up. These helpful bacteria help to degrade nitrogenous toxins (ammonia – NH3 and nitrite – NO2) resulting from the decomposition of fish waste and left uneaten food. Biological filtration is the most important stage which provides a safe and clean environment for your fish and invertebrates. Chemical filtration (media: activated carbon/charcoal) is to remove heavy metals, chlorine, dissolved proteins, and carbohydrates that leaves your aquarium nothing more than a clean and clear water. Some chemical filter media can remove dissolved organic compounds such as phosphates and nitrates which are well-known to contribute to the yellowish water and the outgrow of algae. Each of them has respective mechanism but they help each other (mechanical filtration reduces the load on biological filtration and chemical filtration deals with what was left after biological stage). The best filtration system is one that can provide an ideal environment for all of these filtration types to work together to completely purify the aquarium water. Power filters, also called as Hang On Back filters or external power filters, are a very popular external aquarium filter type on the market today. The power filter is hung on the side of the fish tank (hence its name Hang On Back) and does all its filtration outside the tank. Water is sucked into the intake tube, then it travels through a series of filter media inside the filter chamber including filter media that perform many stages of filtration (biological, mechanical and chemical) before it flows back to the aquarium from the top. This external aquarium filter type is very popular because it can keep the water in a small to medium sized fish tank (10-70 gallons) clean and clear for a long period. The other important feature that makes it a popular choice is its price cheaper than other types of external filters such as canister filters. Cheaper than canister filters and is a great replacement for these luxury filters. Some can’t auto prime by themselves and need your help to get starting. Internal filters, also called as internal power filters, are installed and do their works inside the aquarium. The internal power filter works similarly to the external power filter (the previous type) but it is meant to be submerged in the water. Internal power filters also tend to be smaller than external ones that means their media chambers are smaller and can only work well for smaller aquariums. These filters are popular for low water habitats like turtle tanks. They are also used to support canister filters or external power filters in larger tanks, but their visibility within the aquarium often makes them less ideal. Can be used on reptile turtle tanks with low water level. Not strong enough for a large fish tank. Canister filters are an external pressurized filter for larger aquariums, upwards of 30-50 gallons. They can be set up underneath or next to your tank, so they’re not as limited in size as power filters. Because their capacity is much more larger than power or internal filters, they are the best at all 3 types of filtration (mechanical, chemical and biological). 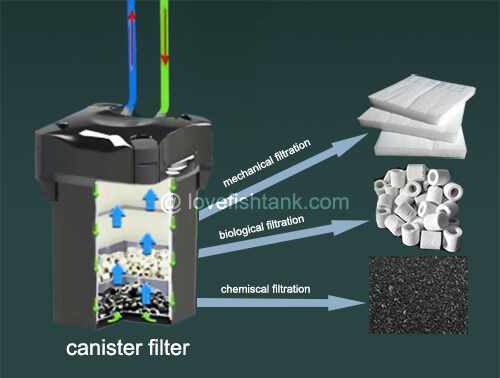 If you have a large fish tank or your aquarium is overload, you should have a canister filter. Ideal fish tank filter for busy people who can’t find more time to clean their aquariums regularly. They are much larger than other filters so they need more space to place. Wet/Dry filters work by trickling water slowly through mechanical media, building up a good amount of oxygen before passing through biological media (commonly bio-ball). This factor combined with greater surface area than canisters or power filters mean these filters are the best biological filters you can find and usually offer (or can be modified for) 3 stage filtration. Wet/dry filtration, especially within sumps (external reservoirs of water plumbed into your tank) is popular and widely used with sensitive systems like large saltwater or reef tanks; as you might expect, then, it’s a bit more complicated than other filters. One benefit of a sump system (there are many!) is that it’s easy to set up natural means of nitrate reduction, like algae. Wet/dry filters can be the complete filtration solution for your aquarium, and there is no better biological filter for heavily stocked systems like reefs, but there are challenges involved that make them less suited to beginners. If you want to learn more about these filters, here’s my full article about them: https://lovefishtank.com/wet-dry-sump-filter/. Corner filters are small plastic box filters which sit on the bottom of the fish tank, above the gravel in a corner of the fish tank. The corner box filter contains layers of filter media (floss, ceramic rings, gravel, charcoal…) through which water is sucked and filtered before exiting from the top. 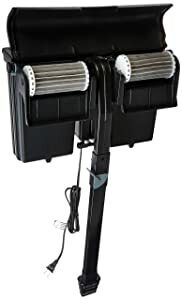 This type of aquarium filters is powered by an external aquarium air pump (usually buy separately) that push air into the filter, and then the air escapes out of the filter making a force sucking the aquarium water into the filter media to perform mechanical filtration. 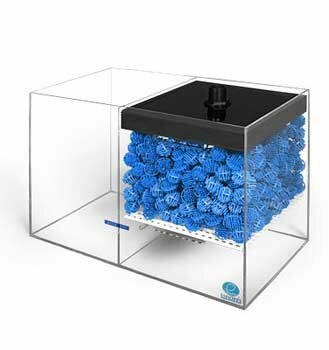 The air pump also provides aeration for helpful bacteria to colonize on the surface of the filter media that performs biological filtration. They are small and cute, small fish and I love them. Sometimes it floats on the water surface. Tip: Sometimes it floats on the water surface because lots of air is accumulated inside of the filter box. If meeting this problem, you can use a suction cup to position the filter in the aquarium wall. The way the sponge filter works is very similar to the corner filter and it needs an air pump (usually not included in the product) to work. Air tubing is placed in the center of the sponge blowing air from the air pump out which makes a force pulling water through the sponge. Any floating debris in the water will be sucked into the sponge leaving the aquarium with great looking water. Flowing water and aeration will cause bacteria to build up on the surface of the sponge for biological filtration. Although the sponge filter is slightly better than a corner filter and just as cheap, it needs frequent cleaning. The advantage is that it does not stir up the water too strong making it ideal for small, fry and quarantine tanks. Find the best sponge filters here: https://lovefishtank.com/sponge-filter/. 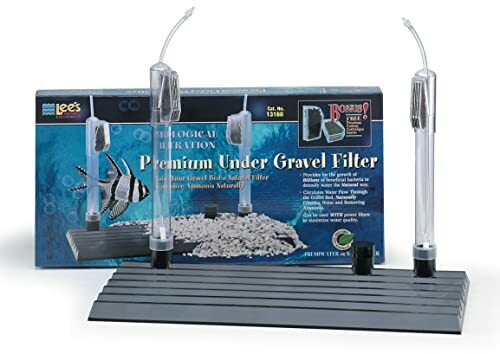 Undergravel filters are cheap and simple and were far more common in the early days of popular aquarium keeping. These filters consist of a filter plate which sits under your aquarium gravel, and uplift tubes which move water slowly through your gravel and through the plate. They can be driven by air pumps or air stones for heavier flow. Undergravel filters may not be the best choice in a tank that’s already established, because you’ll have to tear down your setup to install one. But if you’re just starting out and planning a freshwater or simple saltwater setup, these filters may still be a good choice. Plenty of surface area means good mechanical filtration and excellent biological filtration, using the substrates on your tank’s floor for filter media. (Plus, there are optional chemical cartridges for these filters. )Plants, however, may respond poorly to water flow around their roots. Undergravel filters require regular gravel vacuuming (which you should do anyway) to avoid having to pull them out once installed. Be aware that these filters can develop stubborn buildup underneath that make them a questionable choice for heavily stocked or reef tanks where tear down is going to be considerably difficult. These filters also lose efficiency over time. Opinions about these filters in the aquarium community are divided. Diatom filters are specialized mechanical filters that use a filter media called diatomaceous earth – a sediment made of the skeletons of single-celled microbial algae (diatoms) whose unusual pore structure can trap the smallest particles. Diatom filters are simply the best mechanical filters available. Not only do they provide crystal clear water, they remove algae, parasites, even harmful microbes, keeping your fish healthier, promoting faster healing and greatly improving water conditions. The drawback with diatom filters is that they become clogged very quickly. Because of this, you shouldn’t use them continuously, so they’re not suitable for primary filtration. However, regular use for short periods is an excellent way to maintain top conditions in your tank, especially if you are having problems with fish health or algae. Fluidized bed filters house a bacterial bed for biological filtration that won’t have to be disturbed. They suspend fine-grained sand in a column of water – sand has a great surface area but is a bad choice for most biological filters since water flow easily disrupts it. Fluidized bed filters can be a useful supplement for large aquariums with heavy bio-loads. You’ll also see fluidized bed reactors for chemical media – the same principle suspends fine-grained media for increased surface area and contact time, allowing highly efficient chemical filtration, which is not as effective in higher-flow filters. Fluidized bed devices referred to as filters and not reactors are usually the biological type. Fluidized bed filters are often advised against because they remove oxygen from your system and quickly build up nitrates in power failures. These filters are best for planted aquariums, where they won’t deplete CO2 and oxygen is less of a concern. Marina Slim S10 power filter features a very compact design for easy setup, even in small spaces. 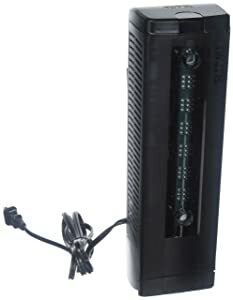 It features an adjustable flow control that makes it an ideal choice for small tanks under 10 gallons with small fish. 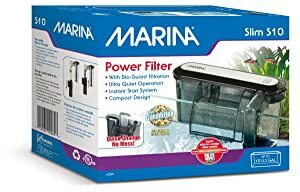 The best feature of Marina Slim S10 power filter is that it operates so quietly but still ensures its filtration efficiency. It can start itself after installation, cleaning or power interruptions without the need of manual priming. This filter uses two filter cartridges to purify the water, Bio-Carb and Bio-Clear. The abundance of biological filter materials (zeolite and Ceramic) included in these cartridges ensures that your aquarium water is free of harmful nitrogenous toxins (ammonia and nitrite). Because you need to buy new filter cartridges for changing, the operation cost of this filter may be higher than other comparable filters. However, the quality of the cartridges is worth for the money. High operation cost for buying cartridges. Other sizes: AquaClear 30 (150 GPH, 10-30 gal), AquaClear 50 (200 GPH, 20-50 gal), AquaClear 70 (300 GPH, 40-70 gal), AquaClear 110 (500 GPH, 60-110 gal). AquaClear power filter is one of the best power filters on the market you should choose for your fish tank. The best feature makes it a favorite choice is its very large filtration capacity that offers you so many benefits. Firstly, you can put a huge amount of filter media (especially ceramic rings) into the large filter chamber to perform the best filtration. Secondly, you can choose your own filter materials to work with the filter without having to use the cartridges come with the package. By this way, it saves you a lot of cost for operating the filter. 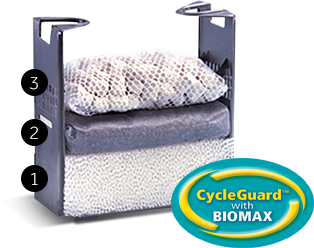 The power filter features a multi-stage filtration mechanism (CycleGuard with BioMax) for the better filtration efficiency in all types: mechanical, chemical and biological. Its patented re-filtration system lets you reduce the flow up to 50% without interfering with the efficiency of filtration. When you lower the flow rate, the water within the filter chamber is processed multiple times to make it ultra-clean and maintain the filtration efficiency. It comes with everything you need for the setup including a foam pad for mechanical filtration, activated carbon for chemical filtration and BioMax ceramite rings for biological filtration. You should place the foam pad at the bottom, the activated carbon bag at the middle and the Bio-Max ceramic ring bag at the top of the filter chamber. The foam filter should be replaced after 2 months, activated charcoal after a month, and BioMax after 3 months. The only drawback is its little expensive price. There are nothing to complain about this filter, it is over great. The filters come in various sizes available for different aquarium sizes for you to choose. Filter media: Rite-Size E” filter cartridges. 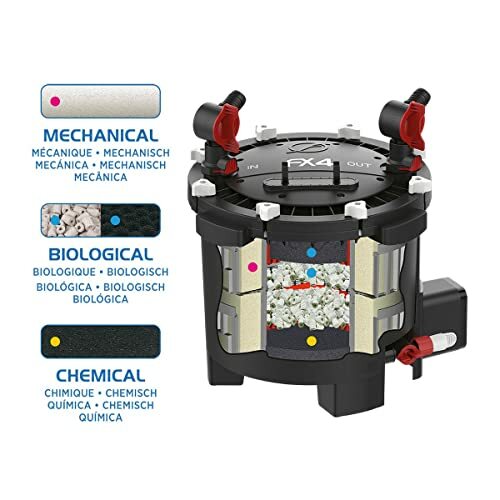 Unlike the biological filtration of other filters using ceramic rings or bio-foams, the Marineland Penguin power filter features a great built-in Bio-Wheel system for the superior performance of biological filtration. Whereby, the aquarium water is free of nitrogenous toxins and safe for your aquarium inhabitants. The filter also uses patented Rite-size E” cartridges with activated carbon included to perform mechanical and chemical filtration. While the floss pads of the cartridges remove debris and dirt out of the water, the activated carbon inside them removes harmful heavy metals, impurities and discolorations. The cartridge is fitted with a patented ribbed back to optimize the contact between water and the activated carbon for better chemical filtration. Easy to set up and maintain with the manufacturer’s instructions. Have to use the cartridges from the manufacturers. Other models: AT10 (57 GPH – up to 10 gal), AT15 (66 GPH – up to 15 gal), AT40 (155 GPH – up to 40 gal). 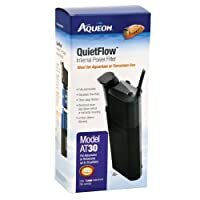 If you love to use a traditional internal filter, Aqueon QuietFlow internal filters are the best and cheapest ones to buy. The filter uses a large internal filter cartridge from Aqueon to give you a three-stage filtration including mechanical, chemical and biological stages. Dense foam for trapping larger particles, activated carbon to eliminate chemical toxins, odors and discolorations, and patented BioGrid to take care of ammonia and nitrites. 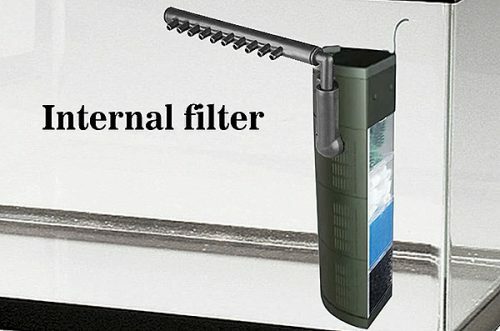 I recommend this internal filter because its capacity is large enough to accommodate some biological filter media that other internal filters can’t do. You can use your favorite filter materials or ones coming with the product package. The flow rate and direction of the water output can be adjustable that makes this internal filter ideal for small aquariums with small fish or turtle tanks with low water levels. This submersible filter can be positioned horizontally or vertically for the flexibility in setup. This is an ideal choice for aquariums or turtle tanks up to 30 gallons. Good for a small to medium size aquarium. Less media capacity than power and canister filters. Other sizes: Fluval U1 (tanks up to 15 gallons), U2 (for 12-30 gal), U3 (for 24-40 gal). Fluval U series underwater filters are designed to be safely applied on freshwater, marine or reptile turtle tanks. I love these filters because their internal chamber is more larger than other internal filters that offers the flexibility in filter media use. 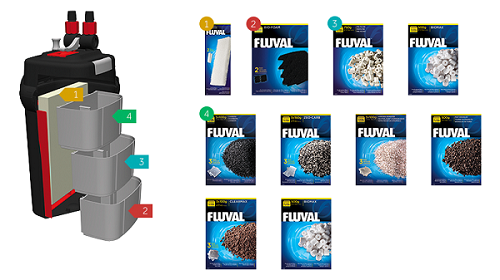 While most internal filters can use only one cartridge which usually contains two types filter media (floss pads and activated carbon), the internal capacity of Fluval U series is large enough to accommodate some Biomax (ceramic rings) to perform more efficient biological filtration. Another unique feature of Fluval U4 internal filter is its integrated spray bar with three-way flow output (two large hoses at the top and bottom, and smaller hoses at the middle) for better water filtration and circulation. There is an adjustment knob on the top output for you to adjust the water output to achieve gentle flow and quiet operation. Good for a small to medium sized aquarium. Other sizes: Fluval 106 (145 GPH, 25 gal), Fluval 206 (206 GPH, 45 gal), Fluval 306 (303 GPH, 70 gal), Fluval 406 (383 GPH, 100 gal). 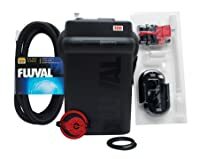 Fluval 306 external canister filter owns many powerful and unique features making it one of the best canister filters in the aquarium hobby. The most advanced features can be mentioned are: durable construction, quiet operation, easy setup, quick and easy maintenance without water leaks and mess. The most feature makes this canister filter loved is large media trays included for containing a huge amount of filter media for better filtration and less maintenance. You can use various types of filter media to perform a multi-stage and complete filtration in all types: mechanical, biological and chemical. The filter comes with all you need for the setup including filter media. It is very easy for you to assemble the filter following the manufacturer’s instruction. The startup is instant with an self priming button and doesn’t need to manually siphon. The sound dampening impeller design gives it quieter operation. Maintenance and cleaning won’t have to be a problem since its lid features one-motion lock clamps for easy assess inside the filter. That makes routine cleaning both quick and easy. Aqua stop valves allow to shut down the water flow without disconnecting the hoses, hence eliminate leaks and mess during maintenance. A little expensive than other brands. Other sizes: Cascade 500 (115 GPH, 30 gal), Cascade 700 (185 GPH, 65 gal), Cascade 1200 (315 GPH, 150 gal), Cascade 1500 (350 GPH, 200 gal). Penn Plax Cascade 1000 Elite is also a powerful and durable canister filter. 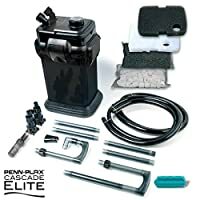 It is an advanced version of Penn Plax Cascade 1000 canister filter. It come with many filter media brackets and large filter capacity for accommodating more filter media and performing the most biological filtration. The filter also comes with various types of filter materials including bio-foam, bio-floss, ceramic rings, activated carbon for a complete and multi-stage filtration system. 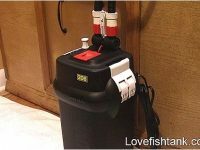 It is very easy to set up and run the filter because everything you need to connect the tank to the filter is available. The filter is automatically primed, only press the prime button on the lid until you get the first water flow from the intake tube into the canister. And then, the filter do its works to keep your aquarium clean and clear. The filter is very efficient in keeping your aquarium water clean and clear for a long period with only a little maintenance. Flow rate control valves and easy-lift clamps for easy setup and maintenance. Less durable than Fluval 06 series canister filters. Other sizes: Fluval FX6 (FR: 563 GPH) for aquariums up to 400 gallons. 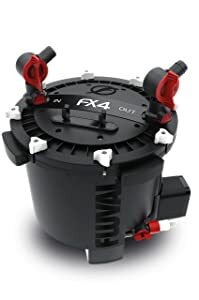 If you have an extra large fish tank that hold over 200 gallons of water, you should consider a Fluval FX4 or FX6 canister filter. 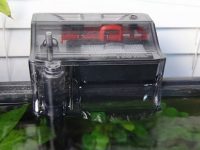 They are external filters designed to keep very large fish tanks clean and clear for a long time with less maintenance. They are great for busy people who don’t have much time to clean their filters. Like other products from Fluval, these external filters are well constructed and very easy to set up, they are also designed to be convenient in use and maintenance for the users. To enable you have the cleanest and most healthy aquarium, the Fluval FX4 is fitted with an excellent filter media capacity. Its media baskets are placed in an easy-to-remove stack for easy cleaning and maintenance. These baskets and foam pads are stacked in a special combination that enhances filtration for the most efficiency and longer maintenance periods. Read the full review of Fluval FX4/FX6: https://lovefishtank.com/fluval-fx6-canister-filter/. Choose a filter which is rated for your tank size. There is a basic rule that choosing a filter which features a flow rate 4 times larger than the aquarium water volume (gallons). For example, if you have a 10 gallon tank, the filter you will need is one with a flow rate of approximate 40 gph (gallons per hour). It is better to choose a filter with an adjustable flow rate. Following are links to articles which include the best aquarium filters rated by tank sizes (gallons) for you to easily choose your one. Choose a right filter type based on your aquarium size, fish types, requirements, and budget. For normal use on small – medium fish tanks (under 50 gallons), using an external or internal power filter is enough and economic. 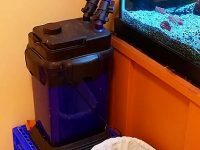 For large fish tanks (over 20 gallons) which stock many fish or large-body fish like Goldfish, Koi fish, or cichlids, it is better to use a canister filter to deal with the large amount of waste discharged by them. A canister filter also helps to reduce the maintenance times you have to do each month to keep the tank clean. For breeding or fry tanks that keep tiny fish, the sponge filter is the best choice if you don’t want the baby fish to be stirred up and killed by a wrong filter. 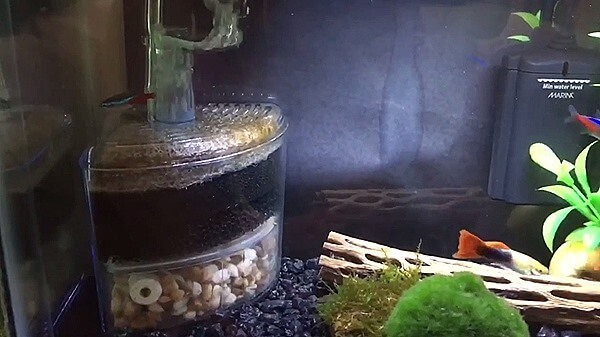 If you keep Betta fish or other fish that love silent water, you will need a filter which provides a gentle flow rate just enough to keep the tank clean but not stress the fish. Large capacity: a filter with a large capacity brings a lot of benefits to you. First, it can accommodate more filter media for the most and multi-stage filtration as well as the longer period between maintenance times. Second, with the large filter capacity, you can choose your own filter media and don’t have to use ones same to which are included in the products. That offers the flexibility in using filter media and lowers the maintenance cost of buying the filter cartridge. Multi-stage filtration: you should choose a filter which can perform multi stages and all types of filtration (mechanical, biological, biochemical). Especially, the biological filtration is the most important stage to keep the aquarium water free of nitrogenous toxins and safe for fish. Quiet operation: you surely don’t want to place a noisy filter in your home. Read the customer’s reviews to know if a filter is quiet or noisy. Durability: choose one that can last for a long time without break or leak. Get your attention to the manufacturer’s warranty and the reviews from other customers. Warranty: Give your attention to the warranty from the manufacturer. A good aquarium filter usually comes with a very long year warranty. Position filter cartridges (if included) in place, layer filter media according to the instruction of the manufacturer. If the manual guide doesn’t mention anything about how to layer the filter media, follow the direction from the intake to output water flow, position the filter media according to this sort: mechanical -> chemical -> biological. Assemble all essential compartments coming with the product follow the instruction of the user’s manual. Some filters like power and canister filters usually come with all you need for the setup; however, some need to buy external equipment to fulfill the installation. If you use air powered filters like corner, sponge or undergravel filers, you need to buy an external air pump to operate them. Position the filter in place. 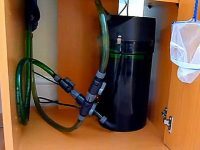 For external canister filter, place it out side the aquarium, under the stand, or inside the cabinet. 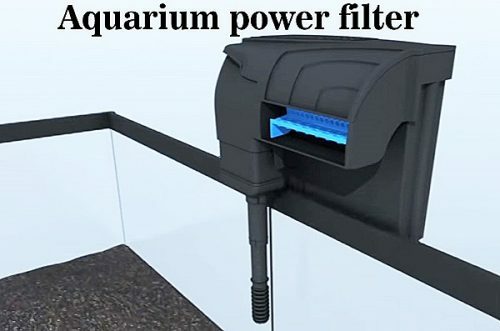 For external power filter, hang it on one side of the aquarium. 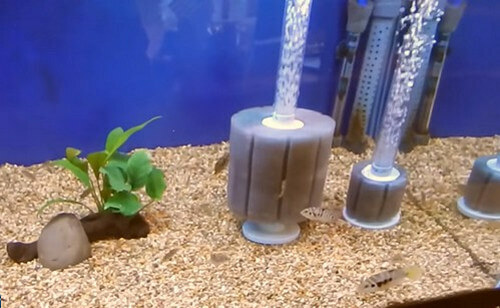 For the internal filters (internal power, corner, sponge, undergravel filters), place them inside the aquarium. Remember to place the air pump outside the aquarium and use air tubes to connect it with the filter (which needs to be powered by an air pump). Plug the filter in and check if it works properly, are there any leaks or breaks? If everything is okay, congratulation! You have succeeded to set up the filter. Remember, the filtration system need a time to be cycled before it can deal well with nitrogenous toxins in the water. If your fish tank setup is brand new, you need to properly cycle the aquarium, this procedure helps to increase the amount of helpful bacteria inside the filter media as well as the aquarium. Remember NOT to add many fish into your new tank until the filter is fully cycled. You should to clean the aquarium filter once a week when changing the water. For large capacity filter types such as canister filters or wet/dry filters, clean them once a month to keep all things work properly. There are some basic steps for maintaining a filter. First, plug the filter out, disconnect its housing, open the filtration system and take out of the filter media. Save the water from the aquarium into a pail for cleaning the filter media. Because chlorine from tap water can kill the helpful nitrifying bacteria living inside the filter media, be sure to rinse them with the old aquarium water which is free of chlorine. The biological filter media (ceramic rings, Biomax, Bio-ball…) and pre-filter media can be reused for a long period; however, the mechanical (foam, floss…) and chemical (activated carbon) ones need sometimes changing. If your aquarium filter uses cartridges specially designed by the manufacturer, check its brand and buy the new ones for changing. You also need to check the manufacturer’s guide to know how and when you should change the filter cartridges. After rinsing the filter media, reinstall them to the filtration system. Finally, reassemble the filter and plug it in, check if there is any water leakage or improper working. Some fish love to live in a gentle environment, too strong water flow can stress and kill them. If your filter doesn’t feature an adjustable flow rate, there are some other ways to decrease the flow of aquarium filter. Use denser filter media (sponge, floss…) or add more filter media as much as the filter can accommodate to reduce the output flow. Use something (decorations, foams…) to slow the direct water flow from the filter. Use a spray bar to distribute the water through small holes and whereby reduce the flow from the filter. For a power filter, the quietest filter brands are Aquaclear, Aqueon Quietflow. I strongly recommend the Aquaclear filters because its filter capacity is far larger than other power filters rated for the same tank sizes. Besides, the flow rate of the Aquaclear power filters is adjustable to reduce the water flow (as well as the noise produced) but remain the filter efficiency. These filters offer more benefits than any other power filters but cost a very affordable price. For a internal filter, choose ones which feature an adjustable flow rate and direction which offer the ability to customize to receive your required quietness. 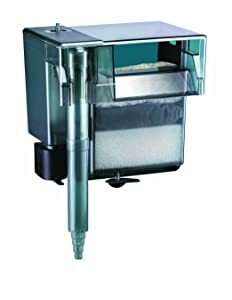 For a canister filter, Eheim Classic series are well-known as the quietest canister filter brand; however, the Fluval 06 series operate so quiet too. 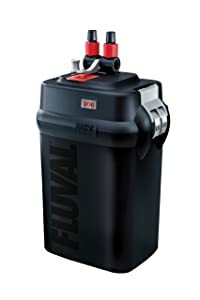 And I strongly recommend the Fluval 06 series because it owns much more advanced features than any other canister filter brands. Yes, you should leave the aquarium filter on 24/7. As you know, the fish excrete waste into the water during the day, it is a source of nitrogenous toxins (ammonia and nitrite) which need to be processed as soon as possible to not harm the fish. Most helpful nitrifying bacteria live inside the aquarium filter (mostly biological filter media), so the filter should always be on to keep the water constantly circled and filtered. The Aquaclear filter owns an internal pump to power itself and you don’t need to buy an air pump to do that work.